We are having a thunderstorm this morning: not at all normal weather for January. The temperature is hanging around 34 degrees so some places could be icy. Daughter Susan has to be at work by 9:00 a.m. She was going to drive the buggy but called a driver instead (“drivers” are non-Amish people that we hire to take us to and from work or town if we can’t go with a buggy and horse) to take her this morning. Son Benjamin isn’t working today so he’ll go pick her up with the horse and buggy this afternoon when she is finished with her work. Benjamin plans to haul manure out to the fields today since the temperature has warmed up this week. He also worked at that yesterday. Our horse, Mighty, pulls the one-horse manure spreader. Our old horse, Diamond, was always the one we used to haul manure. We miss having him around after having him over twenty years. Our new chickens have been laying an abundance of eggs. We still haven’t butchered the old hens, so they are also providing eggs. 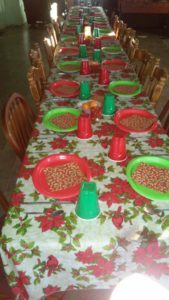 Friday “Old Christmas” (January 6) that I wrote about last week ended up being a very enjoyable day. My sister Emma, Jacob and family, my sister Verena and Susan, and our family were all here. Nephew Benjamin had my name in the gift exchange. I received some dish towels and a mop bucket on wheels with a spin mop. This makes mopping so much easier for the girls. No bending over to squeeze out the mop and the bucket has a dolly with wheels to push the bucket around. Lots of nice gifts were exchanged. Son Kevin received a game called Quick Cups which some of us played. I never heard of this game but it was fun. Each person had five different color cups and everyone took turns flipping a card. Whoever stacked the cups in order of the colors on the cards first, rang the bell and could keep that card. The person with the most cards at the end of the game won. We also enjoyed playing Mad Gab. That is always a loud, exciting game and lots of fun to try and figure out what the card says. After a haystack breakfast for brunch we enjoyed snacks in the afternoon. Veggies and dip, fruits, and venison summer sausage and venison snack sticks were among the snacks. We like to add some healthy snacks instead of so many sweets. Saturday Joe and I and some of our children spent the day helping daughter Elizabeth and Timothy. Joe and Joseph helped Timothy lay a new hardwood floor in their living room while Verena, Lovina and I washed off the walls and ceiling and cleaned furniture from the living room. Church services will be there in two and one-half weeks so lots of cleaning is being done. Lovina, Joe and family enjoyed putting together the biggest puzzle they’ve ever attempted. 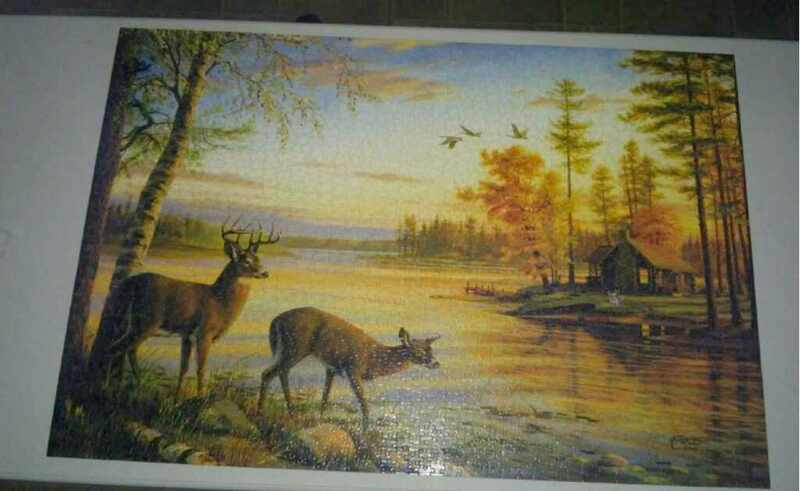 We finished the 2000 piece puzzle we got for Christmas on Sunday afternoon. It took us two weeks to complete it. This is the biggest puzzle we have ever done. We want to glue it and get a frame made for it. Challenging but fun! Yesterday friends and family gathered for a late Tupperware wedding shower for daughter Susan at daughter Elizabeth’s house. Lunch was served afterwards. Susan received lots of nice storage containers to add to her kitchen. She appreciated everyone that contributed and also for Elizabeth opening up her home to everyone. The recipe this week comes from the woman who demonstrated the Tupperware products at the shower, which we enjoyed sampling at the end. Preheat oven to 350 degrees. Combine butter and brown sugar. Mix well, then spread evenly over bottom of a 9×13-inch pan. Drain pineapple, reserving the juice; set aside. Arrange pineapple slices over sugar mixture, then put a cherry half in center of each pineapple slice; sprinkle with nuts. Add enough water to pineapple juice to make 1 1/3 cups liquid. In a bowl, combine cake mix, liquid, eggs and oil; whisk until blended and smooth. Pour over fruit mixture. Bake 35 to 40 minutes or until cake tester inserted in center comes out clean. Remove from oven and cool 5 minutes. Carefully loosen edges of cake and invert onto 18×12-inch grooved cutting board or other large flat plate and cool slightly. Decorate with whipped topping using a frosting bag and tip, or just spoon dollops of whipped topping around the cake. Slice and serve. Just love reading about the happenings at your house and the children’s homes. It is very interesting reading to me. 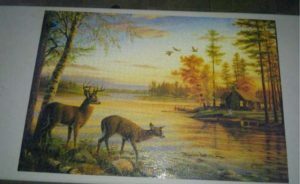 The 2000 piece puzzle looks like a very pretty one to frame and hang. Always will be a nice reminder of the work and fun putting it together. Love reading your stories! Wish you lived across the street! I think that you could maybe help me untangle some of my roots which go back to Jacob Hochstetler, in PA., and the stories of his family. My great Grandpa & family, moved from Missouri to the PNW, and was one of the church planters for an AM church, where I grew up! Can’t find your recipe for biscuits made with mayonaise any chance you can send it me. Thanks!